Nerium AD | Kathy & Co. "More Than Hair"
Hair is only part of the picture we see when we hear the word beautiful, we also see our skin, it’s out there for everyone to see! If you’re active this summer outdoors or lounging by the pool you may have some sun spots. Not to worry, Nerium AD is here to help! This new breakthrough night cream makes my skin feel more beautiful and vibrant with improved texture and tone. So when you come into the salon check out the before and after pictures to see Real Results. For men or women with aging skin or discoloration, this product works. Beauty is very personal! When you look good you feel good, you stand taller and feel more confident, who doesn’t want that? An unfortunate fact of life is that we are all aging. None of us are getting younger, and neither is our skin. With the right combination of products, you can still look and feel young. 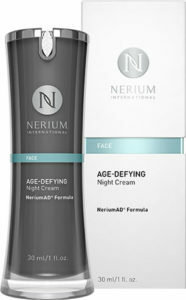 Nerium Age-Defying Night Cream, NeriumAD® Formula is an age-defying skincare treatment with the power to make your skin look its best. Extracted from the Nerium oleander plant, NeriumAD is clinically and scientifically proven to smooth the appearance of wrinkles and discoloration, and improve tone and texture.